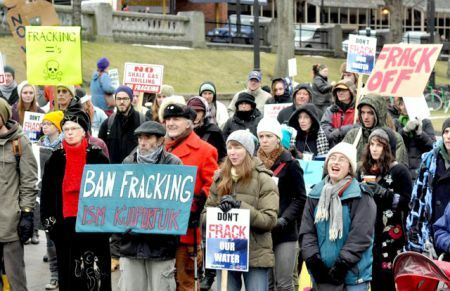 K'JIPUKTUK (Halifax) – The ongoing debacle on what to do with Nova Scotia's fracking waste has taken an inter-provincial turn. Atlantic Industrial Services' facility in Debert, Nova Scotia currently holds about 30 million litres of fracked wastewater from Nova Scotia's only ill-fated adventure in hydraulic fracturing, which took place in 2007-2008. Since Triangle Petroleum's hydraulic fracture of three wells - two in the Kennetcook area and one near Noel, Nova Scotia – what to do with the waste has become an environmental issue approaching legendary status in terms of the twists, turns, ineptitudes and sideshows related to trying to do something, anything, with it. After a tricky measure by which the town of Windsor, Nova Scotia, accepted just over 7 million litres of the wastewater down it's sewer system between 2010 and 2011 – this before the wastewater was found to contain Naturally Occuring Radioactive Materials, which triggered a new series of safety measures in dealing with it – Atlantic Industrial Services has been eagerly seeking a solution to the wastewater it has been saddled with. Why any department in the provincial government wouldn't have thought that the Naturally Occurring Radioactive Materials that are naturally found in Nova Scotia might not come back up with any hydraulic fracturing attempts, before doing the hydraulic fracturing, is anybody's guess. When a new Liberal government imposed a 2013 importation ban on fracking wastewater, the general understanding was that that solution to Atlantic Industrial Service's wastewater problem, whatever it might be, would have to be a homegrown one. Nova Scotia would develop and find some kind of remedy to this problem, all by it's big kid self. Well, call Nova Scotia disingenuous. Atlantic Industrial Services has been up to its old tricks, this time poking around municipal councils in New Brunswick (New Brunswick is not Nova Scotia, FYI), wondering if anybody's got a sewer system for sale and a sleepy public to boot. The company filed a request for an Environmental Impact Assessment with the New Brunswick Department of Environment on June 6th, 2014, to move the 30 million litres to New Brunswick. Then, 60 days later, after the 30 day so-called public consultation period had expired with zero transparency and zero public consultation, Atlantic Industrial Services presented the proposal to dump the 30 million litres down the Dieppe, New Brunswick, sewer system. Dieppe council determined that it “needed answers” before accepting the fracking waste from Atlantic Industrial Services. But it does now raise the question of where might Atlantic Industrial Services strike next. Which city council in cash-strapped New Brunswick might find itself cash-strapped enough to take the waste? Of course, the fiercely pro-shale gas government of New Brunswick will first have to accept Atlantic Industrial Services' Environmental Impact Assessment. For one glaring reason, it is likely that they will. Atlantic Industrial Services' facility in Debert, Nova Scotia, is the Maritimes most technologically advanced wastewater treatment facility. With a Nova Scotia ban on imports (but obviously not on exports) of fracking wastewater now in place, frack-happy New Brunswick will be looking for its own homegrown solution to its wastewater problem. In effect, it will be right down the drain. “The Minister [of the Environment]'s stand is that: 'This is our problem. We have to find a way to deal with it in a way that's environmentally responsible,'” says Errington in Nova Scotia. “The Minister's been really adamant about it. Submitted by Ken Summers on Mon, 08/18/2014 - 18:17. One of the main rationales AIS puts forward for this proposal is that they do not know if they will be able to go forward with disposing of the wastes at the Lafarge cement plant. Two million liters has already been processed at the Lefarge plant. So the immediate and near term pressure that AIS talked up in their proposal has been relieved. Permission to take the rest of the wastes to Lefarge awaits results of testing the cement kiln and stack after the 2 million litres were processed. Those results are probably in. The most likely possibility by far is that the test results will clear the way for AIS to take the rest of the wastes to the cement plant 25 kilometres away. In the unlikely event that Lafarge is not allowed to proceed with disposal at Lafarge, they have a number of months leeway for organizing Plan B. But they went ahead and started spending the money on the Dieppe option, rather than waiting until they needed it. New Brunswick no longer has a means for processing and disposing of its fracking wastes. That used to be AIS Debert before the ban on importing wastes into the province. All the processing equipment AIS uses in Debert is portable and set up there temporarily. It could be set up and used anywhere in New Brunswick. The difficult thing for AIS, and for the frack happy Alward government, is to find a jurisdiction willing to take the processed fracking wastes. AIS does not need Dieppe for the Nova Scotia wastes. They just thought this was an easier way to one step at a time slip under the radar to develop a New Brunswick processing.